The best quality stones in the world from age of dinosaurs! 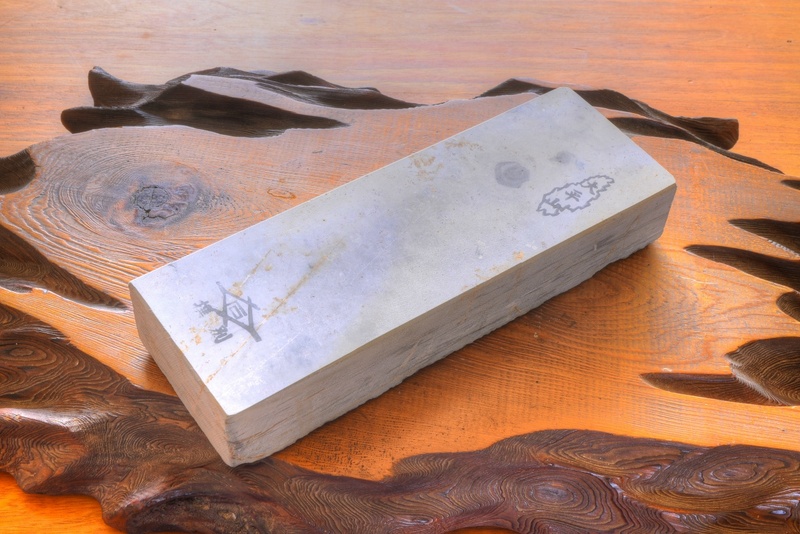 They are natural sharpening stones from Kyoto. I often visit these mines. I had test sharpening all stones of the listed below which were chosen for the best tuning of our knives. They are the only highest quality. These stones were formed 250 million years ago. It was age of dinosaurs. (They're an accumulation of volcanic ashes and clay from the bottom of the sea.) They were piled up only 1mm every 1000 years! Japan has many Onsen, volcano and earthquake, because there had some borders of diastrophism. Accidentally the layer of 250 million years ago were appeared in Kyoto. 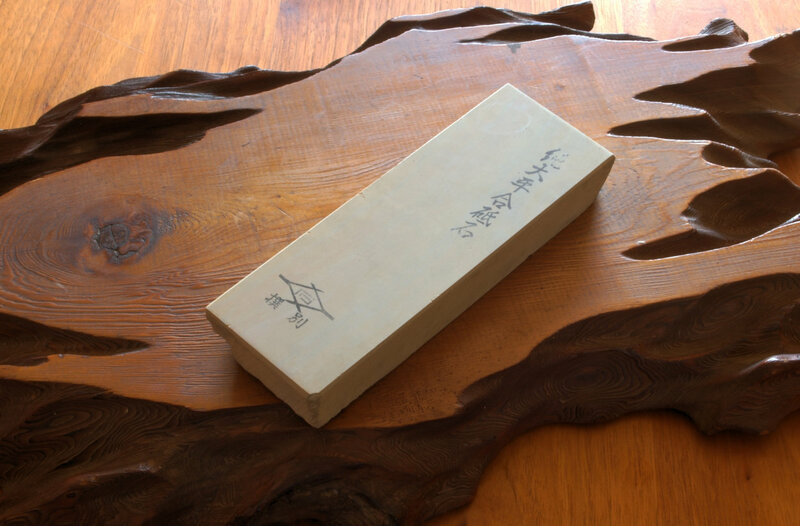 Kyoto's stone is able to say the most wonderful sharpening stone as you know from the quality of traditional blades or swords. You should choose beautiful color and pattern stone, because of rare. You can believe the quality because of my choice. Not one stone is exactly like another. So please tell me if you need the picture of mud (debris) color and the detail feeling. If you want beautiful Hamon appearance and the sharpest edge, natural stone is better than artificial stones. 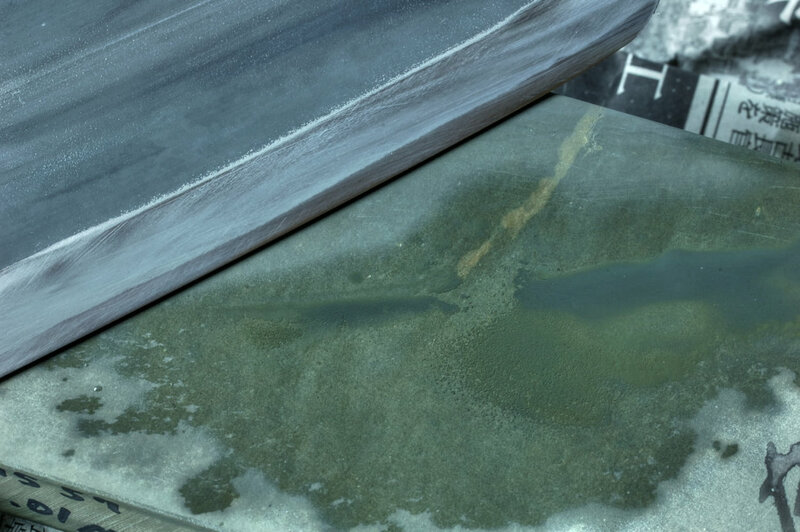 Water and debris that come out from honing is quite important. 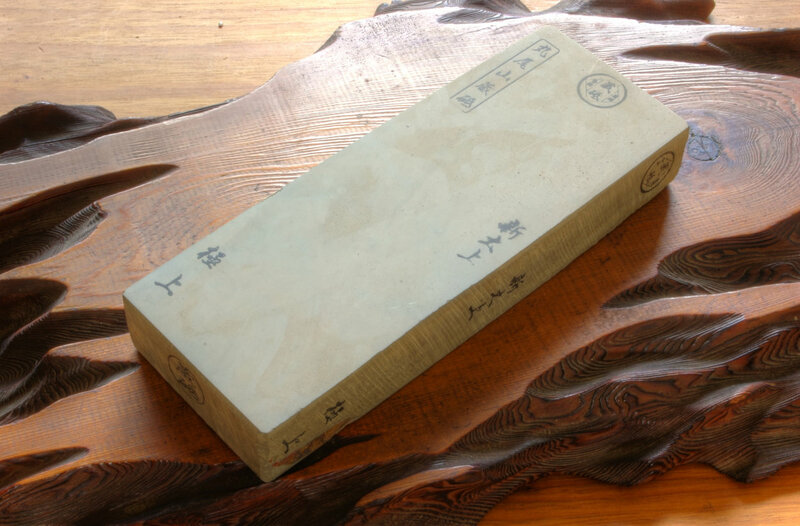 Natural grindstones consist of hard quarts and soft sericites aligned alternatively like puzzle pieces. Debris from honing is the stone surface being peeled off. The hard quartz are ground into a fine texture as horning proceeds, creating a smooth finish on the blade's surface. 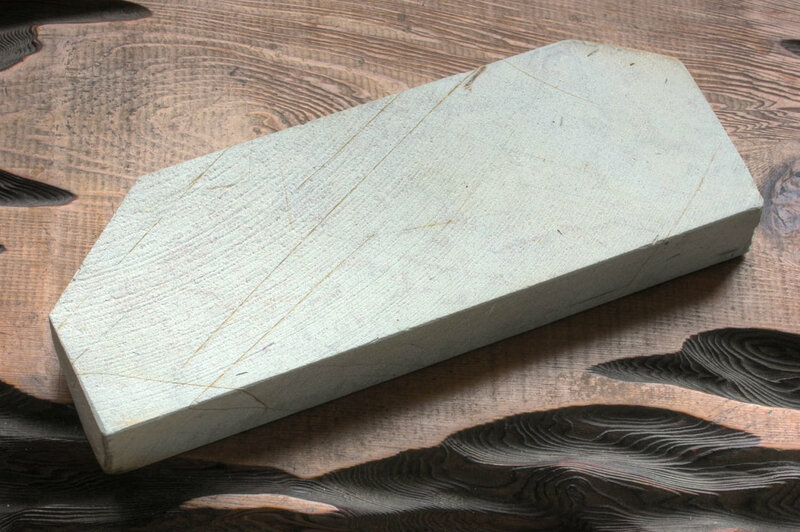 Natural grindstones damage the surface less when honing. For example, it enables blades to refrain from damaging the cells of raw fish when cutting, creating a finer taste. These stones are using for Samurai sword. 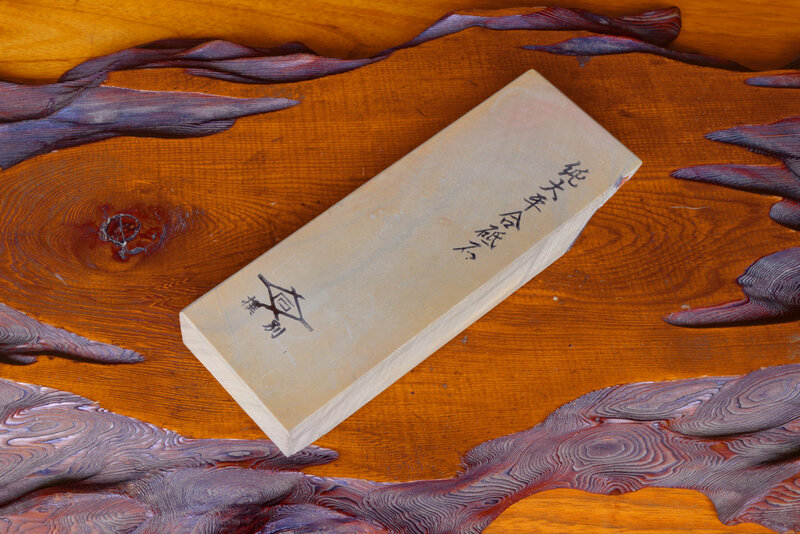 Only the natural grindstones bring out the beauty of these swords. 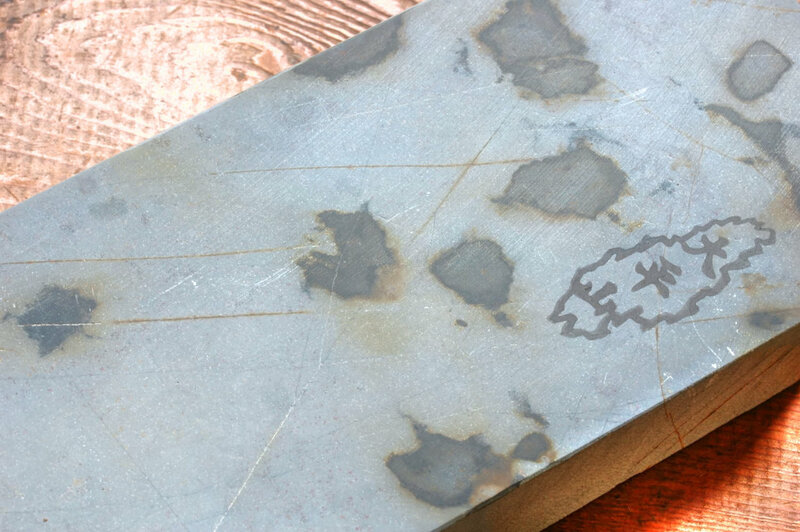 The natural grindstone hones smoothly, maintaining a beautiful wave pattern. 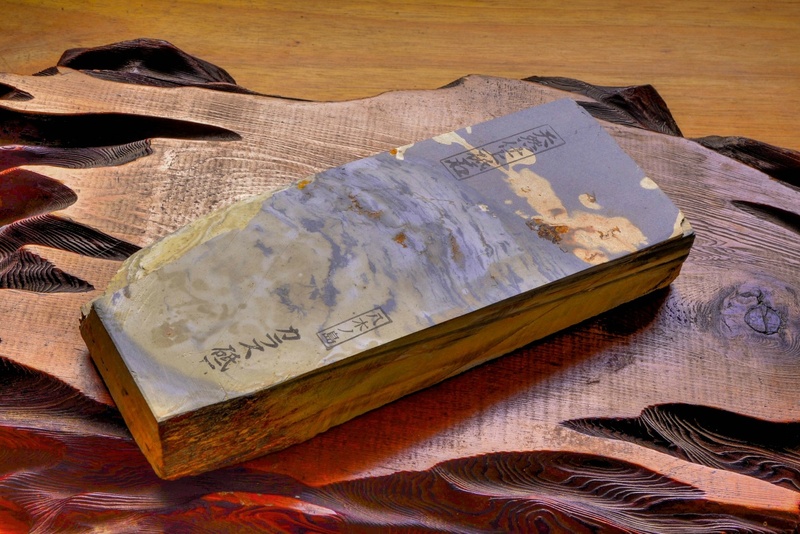 The artificial grindstone, with its excessive whetting strength, loses the wave pattern. Why do you think such an ultimate sharpness is important? Because Japanese people eat raw food that's cut and served. They aren't baked or stewed but cut. So they must be cut nicely. The fines Japanese cuisine is cut and served. So those who cut are at the top of the pyramid. Whereas in France, those who cut are at the bottom because what is cut will be stewed. In Japan, chefs that cut beautifully with their knives are considered to be the best. Such Japanese aesthetics spread among craftsmen, samurais, and everywhere else. And grindstones were the pillar of it all. Thus, Japan's subtle beauty is sustained entirely by these grindstones. What a star! Please try one!! 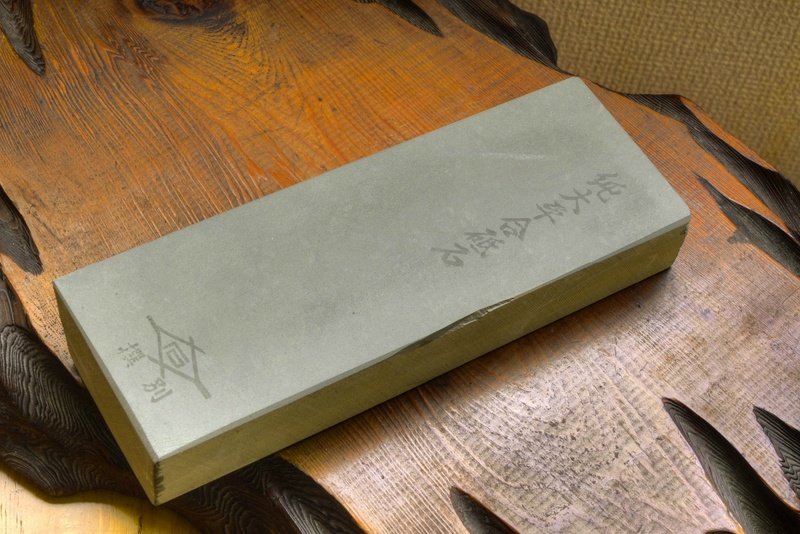 Every Samurai sword makers are using their stones today. I think these stones are the best quality in the world. You can get sharpness quickly and beautiful Hamon easily. #1 Awasedo. Asagi. Ohira-yama in Kyoto. Size 21 x 68 x 200mm. Weight 760g. 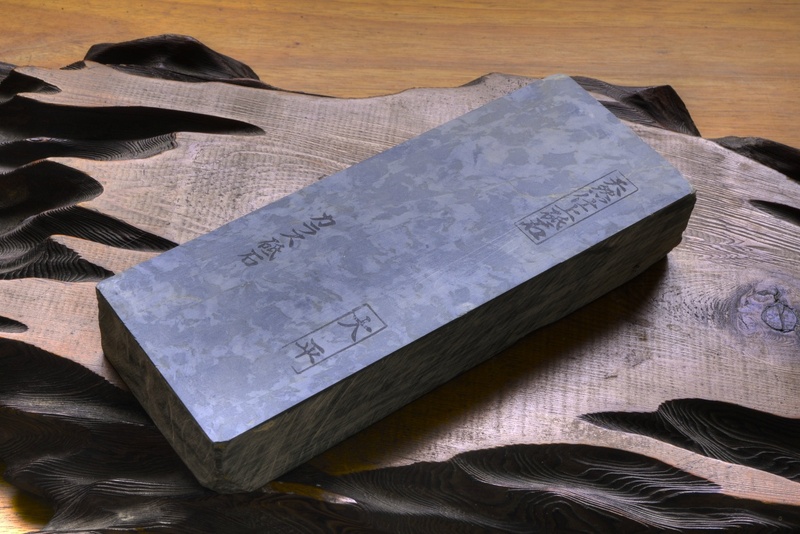 Finest finishing stone, 2.481μm. Hardness: HS57. #2 Awasedo. Asagi. Ohira-yama in Kyoto. Size 25 x 75 x 208mm. Weight 1,050g. 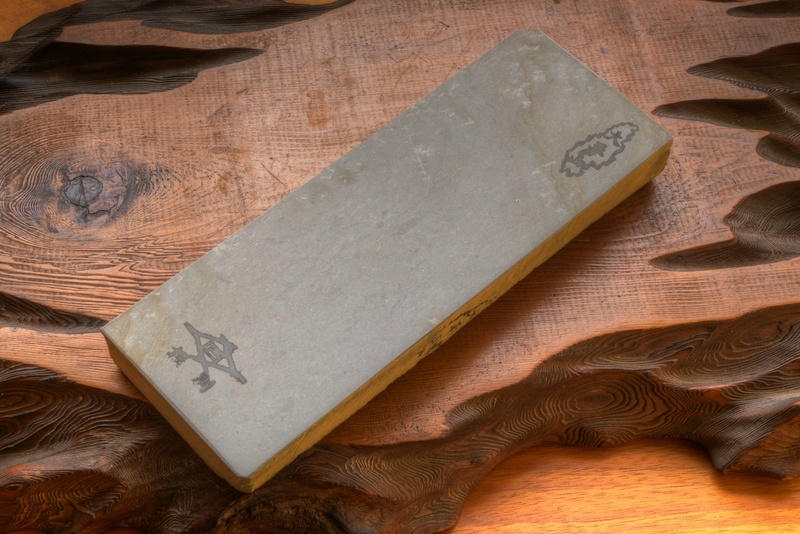 Finest finishing stone, 2.306μm. Hardness: HS74. #3 Awasedo. Shoubu dani in Kyoto. Size 25 x 70 x 193mm. Weight 740g. Finest finishing stone. Hardness: 42HSD. #4 Awasedo. Karasu. Ohira-yama in Kyoto. Size 35 x 75 x 210mm. Weight 1,500g. Finest finishing stone. Hardness: 57HSD. #5 Awasedo Shin Daijo. Maruo-yama in Kameoka, Kyoto. Size 32 x 80 x 215mm. 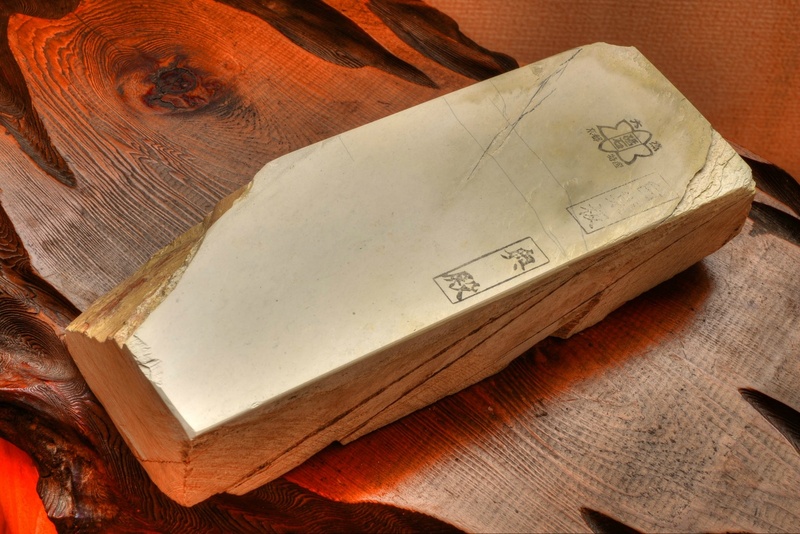 Finest finishing stone. Hardness: HS50. #6 Awasedo. Asagi. Ohira-yama in Kyoto. Size 27 x 65 x 181mm. Weight 810g. 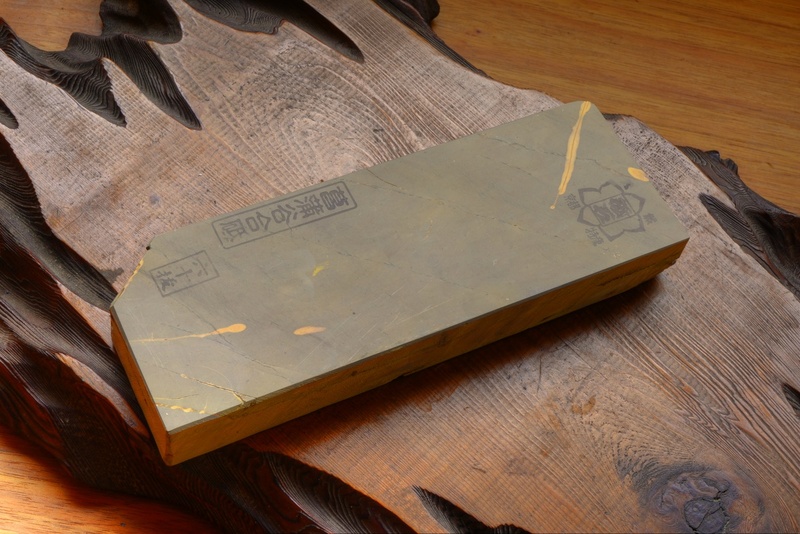 Finest finishing stone. Hardness: HS61. #7 Awasedo. Iromono. Ohira-yama in Kyoto. Size 25 x 64 x 185mm. Finest finishing stone. Hardness: 50HSD. #8 Awasedo. Ohira-yama in Kyoto. Size 23 x 61 x 180mm. Weight 630g. 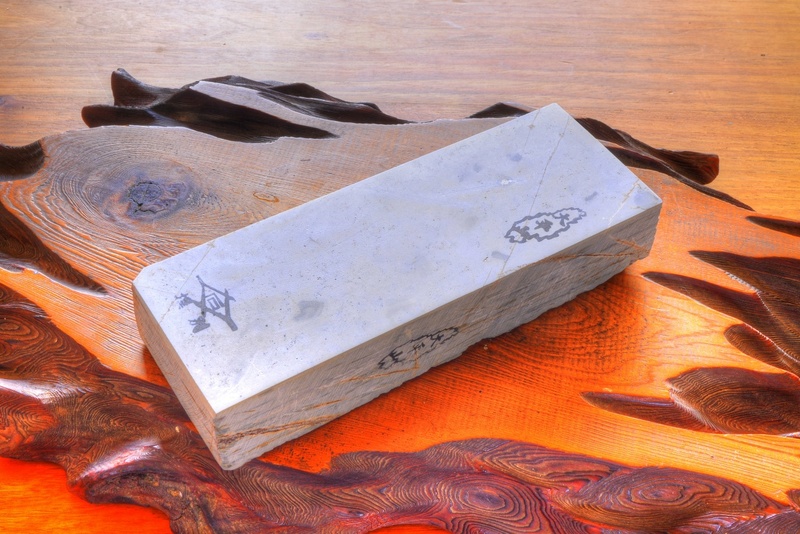 Finest finishing stone, 3.76μm. Hardness: 57HSD. #9 Awasedo. Karasu. Ohira-yama in Kyoto. Size 35 x 75 x 207mm. Weight 1,250g. 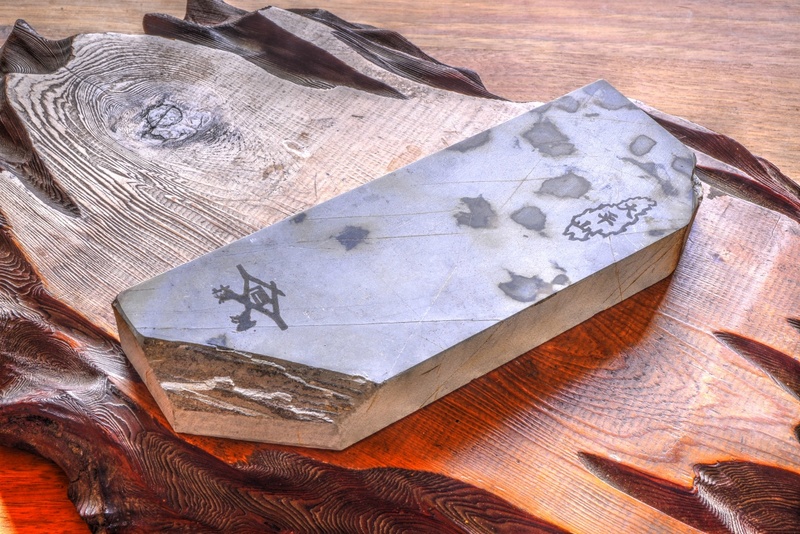 Finest finishing stone, 2.859μm. Hardness: 49HSD. #10 Awasedo. Karasu. Ohira-yama in Kyoto. Size 37 x 75 x 208mm. Weight 1,400g. 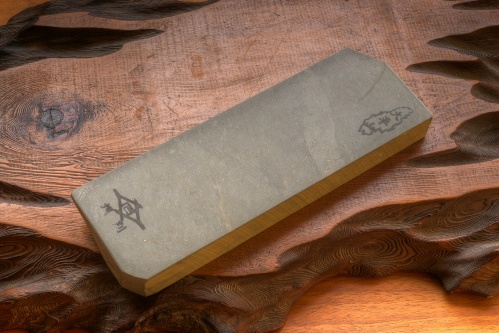 Finest finishing stone, 2.535μm. Hardness: 52HSD. #11 Awasedo. Karasu. Ohira-yama in Kyoto. Size 25 x 75 x 195mm. Finest finishing stone. Hardness: 48HSD. #12 Awasedo. Karasu. Namazu. Yaginoshima in Kyoto. Size 32 x 80 x 210mm. Weight 1,400g. Finest finishing stone. Hardness: 41HSD. #13 Shirosuita. In Okudo, Kyoto. Size 42 x 78 x 200mm. Weight 1,710g. Finest finishing stone. Hardness: HS46. Sharpness test of cutting a picked hair. There are many kinds of sharpness test. Cutting paper or shaving a beard is easy for WATANABE BLADE users, you know. You could cut paper easily even for watanabe knife after 2 years of everyday uses without re-sharpening. This is one of difficult test for master sharpness. I used Kurouchi Nakkiri in white steel from our standard line. The sharpness on the video is not perfect yet. The knife would be much sharper, when you spend more time to stroke on our stone. I've always be impressed with Samurai swords, they are rightly a thing of legend. Have you ever heard a recount that a person toss a silk scarf into the air, as it fell on a Samurai sword it without hesitation split in two? After doing a lot of research I'm sure it was true. Please try that with your knife and the stone!